A month ago, veteran market technician Louise Yamada called for gold prices to drop to as low as $1,250 an ounce. That call turned out to be golden and now, Yamada sees even more pain from here. "The next target is $1,200 or thereabouts," Yamada, managing director of Louise Yamada Technical Research Advisors, told CNBC's "Futures Now" on Thursday. A decline to $1,200 marks another 4.5 percent drop from gold's closing price on Friday. It has tumbled more than 7 percent since a 52-week high set in late January. "We've just had a monthly momentum sell signal which puts the daily, weekly and monthly momentum all negative at this point. So, the path of least resistance appears down from here still," Yamada said. Other technical levels have been broken, too, Yamada explained. Gold broke below its 50-day moving average in late April, and then its 200-day moving average in May. Yamada said its next critical level will be its 200-week moving average, which sits around $1,234. The analyst expects gold to reach the $1,200 in around four weeks, but said it could see a short-lived rally before then. "You could get a minor bounce. It's been going down steadily for four weeks so if you've got a bounce toward $1,270, it wouldn't surprise me," she said. Gold has not touched $1,270 since June 25. That level is just a 1 percent rally away from Friday's close. Any big rally that puts gold well above $1,300 would renew Yamada's confidence in its long-term strength. 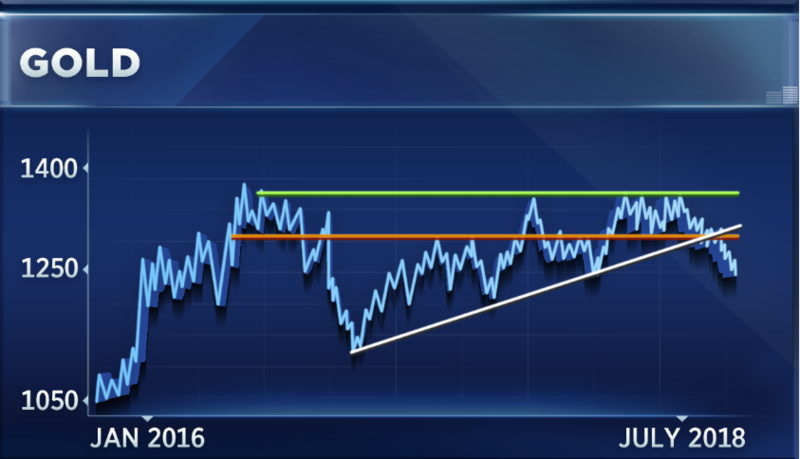 "The resistance over the past three years is around $1,366 to $1,375, so I'd say were the price to lift above that you'd have a nice three-year consolidation, possibly even four-year consolidation," said Yamada. "I would give it $1,400 as even more secure. Go through $1,400 then you've cleared five years of resistance." Gold hasn't traded above $1,400 since September 2013. It ended Friday's session at $1,255.40 an ounce, putting its year-to-date losses at nearly 4 percent.